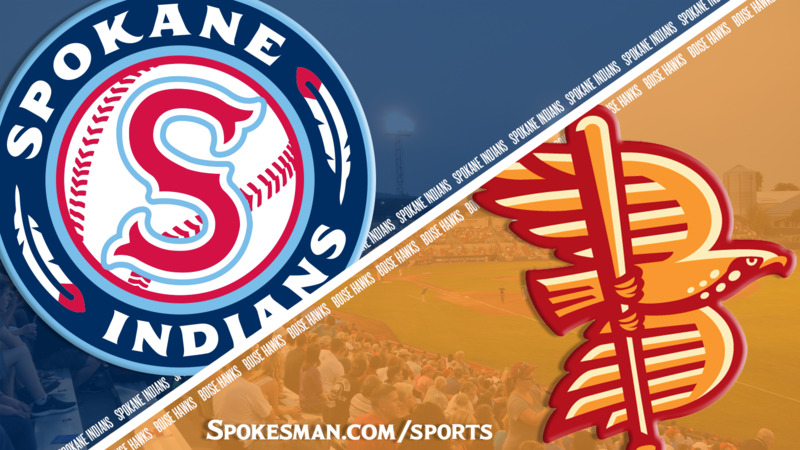 BOISE – Jax Biggers went 3 for 6 with four RBIs and the Spokane Indians beat the Boise Hawks 14-7 at Memorial Stadium on Friday. J.P. Martinez went 3 for 6 with a two-run triple in the ninth inning while Curtis Terry went 3 for 5 with three doubles and two RBIs. The Indians (8-7) remain one game behind Vancouver in the North Division second half. Indians starter Ryan Dease (4-3) allowed three runs on six hits over five innings with no walks or strikeouts. The Indians went right to work against Boise starter Mike Nikorak, the Colorado Rockies first round pick in the 2015 MLB Draft making his second start of the season. Nikorak missed the entire 2017 season rehabbing from Tommy John surgery. With one down in the first, Hasuan Viera walked and NWL RBI leader Terry ripped a liner down the left field line. Viera hustled to score from first. Boise (5-10) got the run right back as Cade Harris smacked a leadoff double and scored on Terrin Vavra’s RBI single. Nikorak was replaced by Pearson McMahan in the second and he was greeted rudely. Starling Joseph walked and Jonah McReynolds crushed an 0-1 pitch for a two-run homer and 3-1 lead. Dease gave up a leadoff double to Hidekel Gonzalez in the third and with two outs Vavra lofted a fly ball to right that carried for a two-run homer to tie it. In the fifth, doubles by Martinez and Terry made it 4-3. After a single by Diosbel Arias (3 for 6), Biggers lined one into left to plate Terry. The Indians opened it up in the sixth. They loaded the bases on a pair of hits by Tanner Garnder and Isaias Quiroz and a walk by Terry. With two down, Arias bounced one to short but Vavra’s throw to second bounced away and all hands were safe, with Garnder scoring. Biggers singled to center to drive in two and Joseph ripped an RBI single to left to make it 9-3. Vavra led off the bottom with a triple and scored on a sacrifice fly. The Hawks picked up another run on an RBI single by Aubrey McCarthy. Viera led off the eighth with a walk, went to third on a single and scored on a fielder’s choice to make it 10-5. Reliever Xavier Moore gave up two runs in the eighth, including Boise’s Willie MacIver fourth homer of the season. Boise’s Joel Condreay, who played shortstop at Whitworth but is converting to pitcher, pitched in the eighth. Cano leads Everett: Seattle Mariners slugger Robinson Cano, on a rehab assignment with the AquaSox (8-7), hit a grand slam in a 5-2 win over visiting Eugene (7-8). Cano is 5 for 8 with two homers and six RBIs in two games. Canadians stay in first: Sterling Guzman went 4 for 5 and visiting Vancouver (9-6) scored four runs in the 10th to beat Salem-Keizer (9-6) 10-7. The Volcanoes scored three in the ninth to force extra innings. Diego Rincones hit two homers with five RBIs for S-K.
Hops win close one: Joey Rose hit a solo homer in the seventh inning and visiting Hillsboro (9-6) topped Tri-City (5-10) 1-0. Harrison Francis struck out five over three innings for the Hops. Luis Asuncion went 3 for 4 for the Dust Devils. Published: Aug. 10, 2018, 9:48 p.m. Updated: Aug. 10, 2018, 10:44 p.m.